Sipping your hot coffee from a paper cup that you can recycle or compost in your community. Enjoying a cold coffee beverage with a recyclable, strawless lid instead of a conventional plastic straw. And checking the Starbucks mobile app to see the journey of your packaged coffee beans as they were grown, processed, traded and roasted. Starbucks leadership will unveil progress and plans on all these fronts at the company’s annual meeting of shareholders, noting that sustainable coffee, served sustainably is an area of particular passion for Starbucks and its more than 380,000 partners (employees) around the world. Over the next year in several markets worldwide, the company will trial new, greener cups. Shareholders will hear the news today as they sip coffee from one of the cup technologies that will be trialed. Starbucks customers in New York, San Francisco, Seattle, Vancouver and London will help test a few different cups that will be both recyclable and compostable in those municipalities’ facilities. Starbucks will choose the cup technologies from NextGen Cup Challenge winners announced earlier this month, working with expertise and support from the NextGen Consortium. Starbucks initiated the Consortium last spring with Closed Loop Partners, and its mission includes identifying cup technologies that can be both recyclable and compostable on a global scale. In addition, the Consortium aims to leverage the scale of its powerful members and industry experts – which a year later include not only Starbucks but also another founding partner McDonald’s, along with supporting partners The Coca-Cola Company, Nestlé, Yum! Brands, Wendy’s and advisory partner the World Wildlife Fund – to work with municipalities to increase acceptance of these new paper cups in recycling and composting programs by showing their value and ability to be recovered and diverted from landfills. 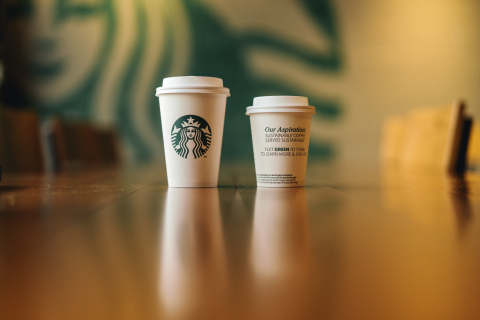 The Consortium’s work supports Starbucks many efforts to minimize its environmental footprint, which include a goal made in 2016 to double the recycled content, recyclability and the reusability of its cups by 2022. Starbucks will roll out new lightweight, recyclable strawless lids to all stores in the United States and Canada in the next year. This is a key milestone as the company works to phase out plastic straws from its more than 30,000 stores worldwide by 2020, eliminating more than 1 billion straws a year – a goal that was announced last July. Newly redesigned, lightweight recyclable strawless lids will roll out this summer to Starbucks locations in Los Angeles, San Francisco, Seattle, Washington, D.C., Indianapolis and Toronto, while the rest of the U.S. and Canada will receive them by early 2020. Starbucks will preview a feature for the Starbucks mobile app that shows its coffee beans' journey from bean to cup. Senior vice president of Global Coffee & Tea Michelle Burns will unveil for shareholders a future feature for the Starbucks mobile app. The reveal will accompany an on-stage tasting of digitally traceable Starbucks Pike Place® Roast, the package of which, in the future app feature, can be scanned to see its journey from origin to the package. As the audience will sip their Pike Place from one of the new greener cups the company will trial, they’ll learn that 80% of their cup’s coffee beans came from Colombia and 20% came from Brazil. They’ll see the beans are verified as 100% ethically and sustainably sourced; information about Starbucks responsible sourcing standards and open-source Farmer Support Center in Colombia; where the beans were roasted (in Kent, Wash.); and brewing tips for a perfect cup. Now one year into a two-year project to explore the benefits of digital traceability, Burns emphasizes Starbucks ambition of greater empowerment for coffee farmers as customers better understand where their coffee comes from and who grows it. Eventually, customers will be able to use the Starbucks mobile app to trace the journey of their Starbucks packaged coffee. Since 1971, Starbucks Coffee Company has been committed to ethically sourcing and roasting high-quality arabica coffee. Today, with more than 30,000 stores around the globe, Starbucks is the premier roaster and retailer of specialty coffee in the world. Through our unwavering commitment to excellence and our guiding principles, we bring the unique Starbucks Experience to life for every customer through every cup. To share in the experience, please visit us in our stores or online at https://stories.starbucks.com/ and www.Starbucks.com. (c)Business Wire. All of the news releases contained herein are protected by copyright and other applicable laws, treaties and conventions. Information contained in the releases is furnished by Business Wire's members, who warrant that they are solely responsible for the content, accuracy and originality of the information contained therein. All reproduction, other than for an individual user's personal reference, is prohibited without prior written permission.